Whether cooked over an open flame or inside your kitchen, these ribs bring back memories of summer from Aviva Goldfarb of The Six O'Clock Scramble. See the full post at Kitchen Explorers. To make the glaze, combine 1/4 cup pineapple juice (from the can of pineapple slices), ketchup, Worcestershire sauce and 2 Tbsp. brown sugar in a small saucepan. Bring it to a boil over medium-high heat and simmer it for 8 - 10 minutes until it is thickened and has reduced by about 1/3. Set it aside. Grill the ribs for 20 minutes, turning them once. Then, brush the top side of the ribs with the glaze and continue to cook them, flipping and brushing with sauce every 5-10 minutes, until the ribs are nicely browned and the meat cuts easily with a sharp knife, about 40 minutes total (but check them sooner if your grill runs hot). If the ribs start to blacken reduce the heat and move them off the direct heat. 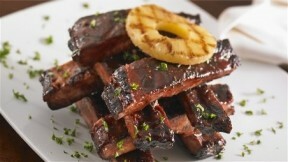 When the ribs are about 10 minutes from being done, grill the pineapple slices directly on the grates of the grill for 3 – 5 minutes per side until they are lightly browned. If any glaze remains, bring it to a boil for 2 minutes on the stovetop to eliminate any bacteria from the raw meat, and serve it on the side with the ribs. Cut the rack(s) into individual ribs to serve. Serve them immediately or refrigerate them for up to 3 days (if you can wait that long! ).